Click here to watch the clip of my live France 24 interview that took place in the Paris studios on Monday, December 21rst. It was a fun but intense lead in to the reading at Shakespeare and Company bookstore in the evening. 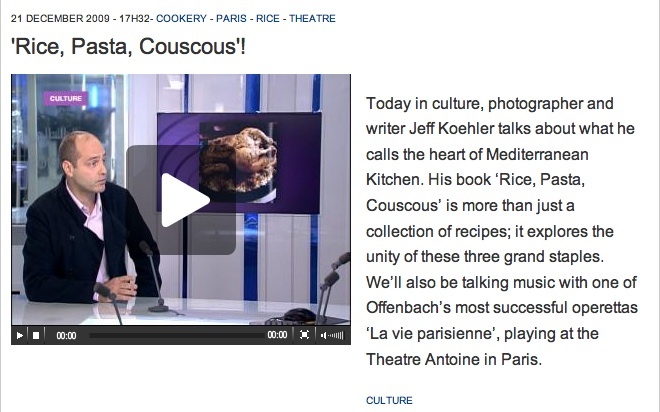 On Dec 21rst at 12:45 Paris time I will be a guest on France 24’s daily English-language culture program to talk about Rice Pasta Couscous. France 24 is the French version of CNN International and the BBC World Service - available around the world and online. The show will be rebroadcast six times during the day and available online. An excellent and spot-on review in Publishers Weekly, the venerable American trade magazine magazine targeted at publishers, librarians, booksellers, and agents.